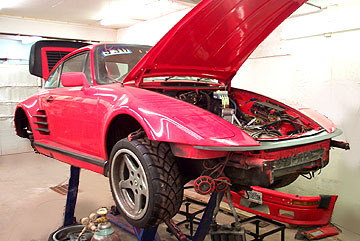 Here is our oil cooler system from the end of fabrication to the end of installation. It is fully plumbed with AN -16 Stainless Steel braided lines and AN fittings. The end result was a SIGNIFICANT drop in oil temperatures at the track, from 250+ down to the low 200 range. 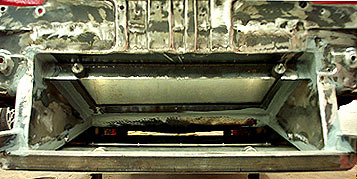 The lower reinforcement also has already saved the cooler and spoiler from some impact damage. Considering the cooler goes for $500+, it was worth it. A complete success! This is how our cage starts; just a bunch of tubing . . . 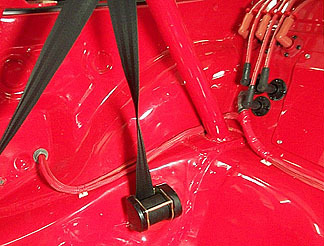 The suspension system is mostly hidden . . . that is until you take a corner hard. Then it takes center stage! 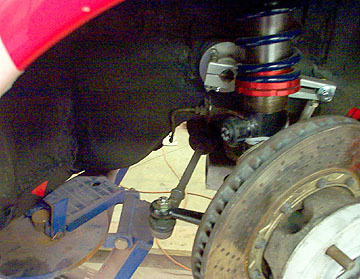 The Tarret Engineering Sway bars and Leda Coilover shocks/struts are highly tuneable and ready for years of rugged use. 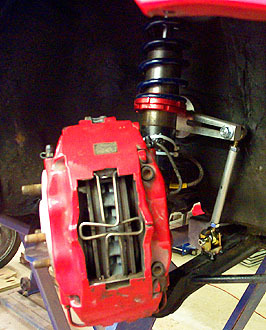 Except for the Racer's Edge camber plates and the custom mount plates I made, the finished shock tower almost looks like it came that way. There's enough adjustability here for any situation or configuration. 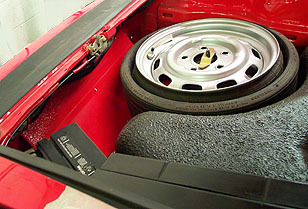 damage to the floor pan. 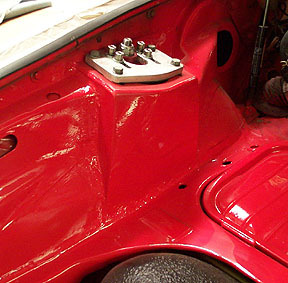 The little red triangle painted on the chassis in the upper right photo signifies one of the fabricated, reinforced lift points that were welded in at all four corners to give a good place to raise the car on. Details!! is ready for anything.The owner is making the most of it with probably 15-20 track days since mid June! However, There are always things that fail, wear out... extra needs, or just more that one WANTS to do. Which brings us to the next portion of the story. At some point an Electromotive HPV electronic ignition was installed on this car. This is a fairly basic programable system that worked quite well. 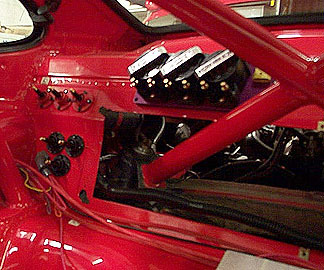 One "drawback" of this system was that the coil pack (or "DFU" Direct Fire Unit - upper right) and the ECU (Electronic Control Unit - lower right) were combined in one unit looking like a DFU. Unfortunately, the DFU-to-ECU connections were not well sealed, moisture leaks resulted in corrosion, and proper voltage outputs were then hit and miss... mostly miss! In building this current system we are looking into the future. The Electromotive Tec3 system sourced from 944 Enhancement will control EVERY aspect of engine function, from ignition to injection. It is fully programmable in real time for all parameters of engine performance, and the running information can be downloaded to a laptop. Explosion at a Spaghetti Factory ! that plan is an eventual twin plug setup. 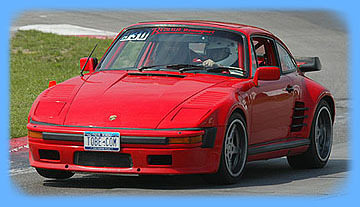 911 engines benefit greatly from this because it allows for a more even flame front when the cylinder charge is fired. This improves fuel and power efficiency, and evens load on the pistons. It also reduces the chance of "hot spots" and resulting burned pistons. It was decided to ready the setup for that mod, which will be done when any portion of the engine requires freshening. For now, we will be sticking with the CIS injection - which works fairly well - and single plug ignition. 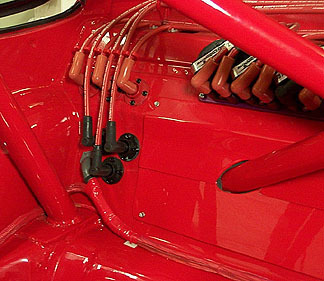 (TPS), Manifold Air Pressure (MAP), Manifold Air Temp (MAT), Cam and Crank Fire Hall Effect magnetic pickups, etc. LOTS OF WIRES = Potential MESS! Not to worry... I don't makes messes . . . I clean them up! placed. This freed up a lot of extra room to get at the spark plugs and to work up the sides of the engine. I had insisted early on that the main components be located in the cabin to protect them from heat and moisture. It was also a grand opportunity to create a stunning visual display! Given the previous system's failure, this was not a hard sell! The plan in my head worked out, as there was just enough room to locate the coils and plug terminals surrounding the rear access panels on the firewall. It was decided early on that the Tec3 would be stand-alone, using as little of the nightmare-ish OE wiring system as possible. The black fuse/relay assembly you see above left is for the Tec3, and it seemed that the orignal power relay board was a good place for this. 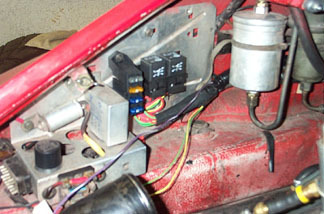 The main power lead connects to the hot terminal on the starter (right lower front of engine),and every system ground is terminated at the ground post I welded to the rear suspension x-member (next photo down). No searching for random ground points anymore! 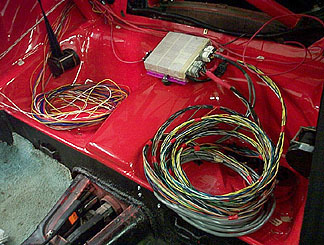 At right are the custom Magnecor wires I had made for the car. 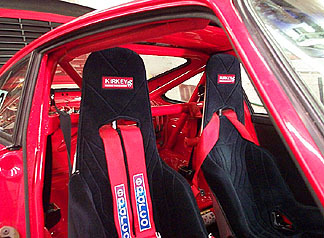 4-panel mirror, even the high-density Kirkey roll bar padding, make this a nice place to do business. 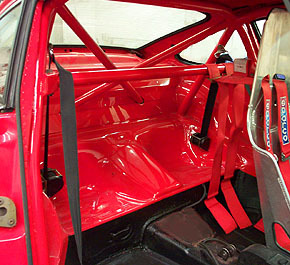 The molded in dash and side hoop are so seamless that one might not notice there was even a cage there at a quick glance! The added stiffness has REALLY boosted the steering response and overall handling as well. Since I had no firm idea of how long they needed to be, I had them made with 4' open coil ends and finished them to fit. With 10' of extra wire and bags of connectors and boots, I was all set for this custom install. As luck would have it, I was able to make many of the shorter interior wires with what was cut off of these plug wires. 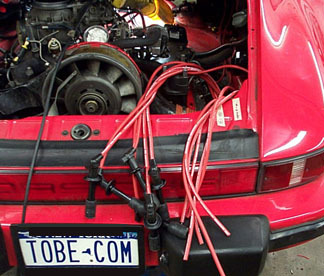 Incidentally, if you ever want to get the No-Bull straight scoop on plug wires, just go to the Magnecor website. magencor.com You'll soon learn that most of what you thought you knew is pure advertising hype and utter BS! 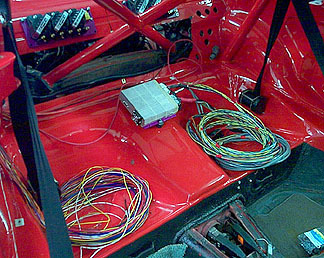 At left I am sizing up the cable routing, running wires to and from the engine bay, and Tec3 ECU. One idea I am particularly proud of is the spark plug terminals you see at the left side. These are normally intended to be firewall pass-throughs for interior mounted ingition coils. I figured if it was good for a coil wire, why not the plugs? Having to cut holes in the firewall big enough to pass 12 wires through is bad enough, but then how do you seal it? No worries with the MSD terminals! SLICK!! Here is one side finished up. 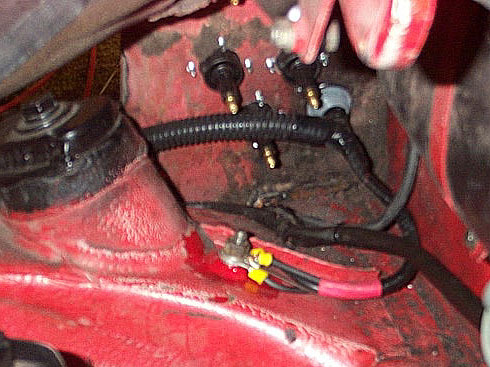 Note that the terminals and boots of each set are a different colors; red for the upper set of plugs, black for the lower. They are also numbered, and labels will be affixed to the firewall for quick and easy removal and installation of the wires at both ends. much neater than the ubiquitous AN Adel clamps. It all makes for an extremely pleasant and functional install. channel. 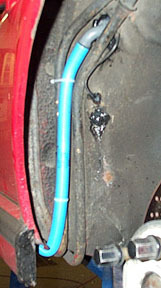 The 90 degree threaded sleeve fittings fasten securely to the sheetmetal, and screw tightly into the semi rigid blue plastic conduit running up the oil lines on the right side. Tough, dry, and secure! screws that hold the fiberglas dash top on. The efficacy of this easy-out design was readily apparent, and paid huge dividends when it came time to wire these goodies. The glowing light at right signifies that the discretely-wired Tec3 system is powered up. The indentical unlit lamp to the left is a check engine light. The photo at right shows the command center for the Tec3 and Data Acquisition systems. 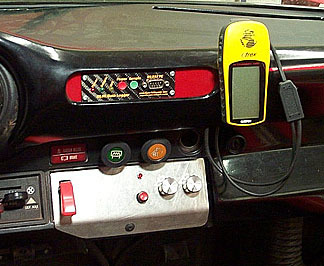 The custom hole in the dash top face houses a DL90 Datalogger from Race Technologies of Nottingham, England. The DL90 combines accelerometer technology, and GPS info from the Garmin eTrex at right, and can calculate acceleration, speed, power, rpm and track position 100 times every second for nearly 90 minutes. The software provided allows full analysis of the log easily and quickly on a laptop. The fabricated aluminum panel (eventually to be painted) houses the main Tec3 aircraft safety power switch. 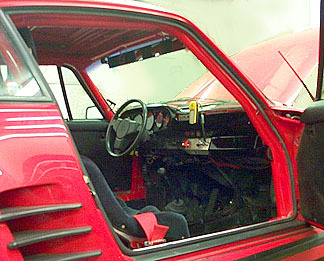 A simple flip up allows access to the toggle switch, and a flip of the safety cover down shuts off the car and protects the switch from accidental engagement. The red button is a datalog-on switch with red LED indicator lamp above. 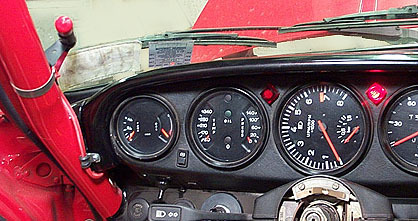 The two dials (potentiometers, or "pots") are for "trimming" the fuel and spark curves when the fuel side of the Tec3 system is installed. The system did gives us some minor fits at the first event at VIR in November, but once the details were ironed out it performed very well. No more guess work as to what is going on. The laptop will tell all ! !